If the backup cache is enabled for the job, you can monitor status of restore points in the backup cache. 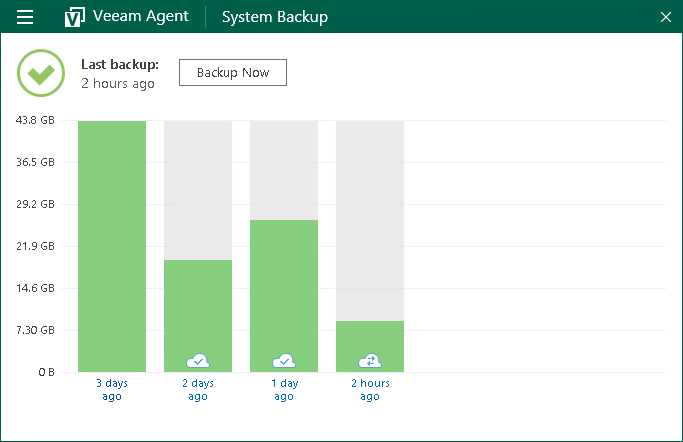 Veeam Agent for Microsoft Windows displays the restore point status through the icon on a bar in the chart. Check mark over the icon. The backup file created within the backup session is saved on the target storage. The backup file created within the backup session is saved in the backup cache. Sync sign over the icon. The backup file is being uploaded from the backup cache to the target storage. Error sign over the icon. The backup file was not uploaded to the target storage and has been deleted from the backup cache. You can also monitor the backup cache activity and view detailed statistics on the restore point upload process. To learn more, see Monitoring Backup Cache Activity.